Teeth Whitening - the Facts! Tooth whitening has become very popular over the last 15 years, and for good reason: It's a safe, effective way of improving your smile at relatively low cost, giving you a brighter, healthier and younger appearance. Research in the last 15 years has discovered exactly how the whitening process works, giving us systems that work faster, without that tooth sensitivity that used to be a problem. AND prices have dropped, making it more affordable. Ready for a bit of science? Here are some teeth whitening facts, to explain the chemical process. I'll try to keep it simple! But first, why do teeth become dull over time? What makes them look dark? We all know that our teeth seem to become dull as the years pass. And then we notice that it's NOT just a dullness - our teeth can start to look yellow! So what's going on? It's all to do with the fact that our teeth are NOT solid dense tooth enamel. An explanation of teeth whitening facts must make plain that tooth enamel is NOT solid, like your kitchen sink! In fact, it is microscopically like a sponge, with lots of tiny pores and channels going straight down into the tooth. Over time, things like tea, coffee, dark sodas, highly colored foods, cigarette smoke etc. all contribute to a slow build-up of tiny molecules deep inside the enamel. These molecules gradually get bigger and bigger, sometimes sticking together to make even LONGER molecules. Long-chain molecules are very dark, and the bigger they get, the darker they get. Still with me? So, what is teeth whitening? Teeth whitening is a bleaching process that removes the microscopic stains in tooth dentine and enamel. The active ingredient is hydrogen peroxide. This means that if your teeth are quite white already, then they will not whiten up much more unless you use one of the best teeth whitening products. 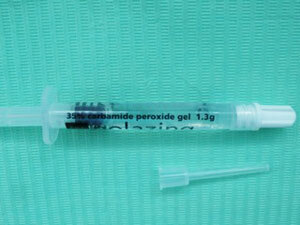 Any teeth whitening product breaks down to hydrogen peroxide. The molecular oxygen, oxygen ions and oxygen radicals are responsible for whitening, and I call these by-products "bleaching factors". So why is tooth whitening so slow? Why does it take so much time to get a significant and LONG-LASTING whiteness? 1. Oxygenation. This is the "scrubbing bubbles" action that actually starts to break up debris in the surface of the tooth enamel, and REMOVE that staining debris. This takes time to really start getting into the enamel. 2. Conversion. This is where oxygen ions and especially oxygen radicals break up the long-chain stain molecules into millions of tiny molecules. When the oxygen radicals break down these large molecules, the resulting smaller molecules appear colorless or white. So NOW the teeth start to look whiter! It takes TIME to condition the teeth by removing the debris in the surface of the tooth enamel. You have to get this microscopic debris out of the way before the oxygen radicals can get deeply into the enamel of the tooth, to break down those big dark molecules into smaller, colorless ones. This is precisely why one-hour chairside bleaching often shows little or no results, or else doesn't last very long. There just isn't enough time to get rid of the microscopic debris within the surface tooth enamel, and then break down those deeper, big dark molecules. This is why I prefer a home whitening technique. At most, I use a one-hour chairside session for the "oxygenation" step. Then the home whitening is faster. My favorite home whitening system that you can get online is the SNOW system. Now let's talk about products and why cheap products cause problems. Sorry, there's a bit more science to explain all the teeth whitening facts! Bleaching gels are unstable chemicals; they are supposed to be! This is why they can break down so quickly and release their bleaching factors. The downside is that they start breaking down immediately after they are manufactured! I WARNED you there was some more science! Don't worry, we're almost there for teeth whitening facts! 1. Constant refrigeration is very expensive for bleaching product companies. You are talking about refrigeration at the factory immediately after manufacture. Then refrigerated trucks or airplanes to the bleaching product company from the factory. Then in refrigeration at the bleaching product company. Then shipped with thermally insulated containers with cold packs from the bleaching product company to the dentist. The ONLY tooth whitening system that relies entirely on refrigeration is the KöR product, manufactured in California. 2. "Anhydrous" stabilizers can be added to stabilize the bleaching gels, but there are major problems with this. If you stabilize the gel for the purpose of shelf life, then this means that the bleach is too stable when placed on the teeth, and it doesn't work nearly as well as it should! So if a manufacturer is going to use an anhydrous stabilizer, they want to keep it to a minimum - just enough to stop the whitening gel reacting and breaking down in the tube before it gets near your teeth. Of course, different manufacturers use different amounts of stabilizer. 3. Adding acidifiers results in an acidic bleaching gel. But there's a problem. On its own, hydrogen peroxide tends to become more acidic anyway as it breaks down. So as the peroxide is breaking down on your tooth enamel, releasing the bleaching factors, it's getting more and more acidic. If you START with an acidic gel, it becomes even MORE acidic as the gel breaks down to release oxygen! Also, adding acids to the gel slows down the reaction, and so you don't get much whitening, AND the acid gel attacks the tooth enamel. So manufacturers have to try to use a very small amount of acid stabilizer. Just enough to stabilize the gel, without making it too acidic. Again, different manufacturers use different amounts (and formulas) of acidic stabilizers. Guess how ALL the cheapest bleaching gels are stabilized? Yes, you guessed it, they use high levels of anhydrous and acidic stabilizers. This means that they may NOT whiten teeth very well, and they tend to cause a LOT of sensitivity. THE TRICK is to use a whitening gel with low levels of stabilizers, and keep it cold! To get effective teeth whitening with minimal sensitivity, you have to use a product that has been formulated well, with low levels of stabilizers, and been kept cool the whole time. For a home-based whitening system you can order online, I recommend SNOW. This tends to be more expensive than the cheaper gels, but like anything else in life, "you tend to get what you pay for! "